^ 欧盟将增加官方语言. 新华网. 2006-12-10 [2014-01-22]. （原始内容存档于2014年2月19日）. ^ 4.0 4.1 Paul Cubberley (1996) "The Slavic Alphabets". In Daniels and Bright, eds. The World's Writing Systems. 牛津大学出版社. ISBN 978-0-19-507993-7. ^ 許文廷. 東歐. 橘子文化事業有限公司. 2004: 200–. ISBN 978-986-7545-21-3. ^ 哥伦比亚百科全书, 第6版. 2001–05, O.Ed. Saints Cyril and Methodius "Cyril and Methodius, Saints) 869 and 884, respectively, “Greek missionaries, brothers, called Apostles to the Slavs and fathers of Slavonic literature." ^ Kazhdan, Alexander P. The Oxford dictionary of Byzantium. New York: 牛津大学出版社. 1991: 507. ISBN 0-19-504652-8. Constantine (Cyril) and his brother Methodius were the sons of the droungarios Leo and Maria, who may have been a Slav. ^ Schenker, Alexander. The Dawn of Slavic. 耶鲁大学出版社. 1995: 185–186, 189–190. ^ Lunt, Horace. 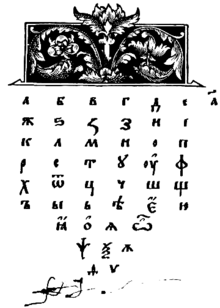 Old Church Slavonic Grammar. Mouton de Gruyter. : 3–4. ^ Wien, Lysaght. Old Church Slavonic (Old Bulgarian)-Middle Greek-Modern English dictionary. Verlag Bruder Hollinek. 1983. ^ 霍文. 蒙古国　传统蒙文在回归. 人民网. 2010-08-06 [2014-01-22] （中文）. ^ 杨建军. 中亚华裔东干文学与伊斯兰文化. 中國社學科學網. 2012-05-30 [2014-01-22] （中文）. ^ Bringhurst (2002) writes "in Cyrillic, the difference between normal lower case and small caps is more subtle than it is in the Latin or Greek alphabets,..." (p 32) and "in most Cyrillic faces, the lower case is close in color and shape to Latin small caps" (p 107). ^ Serbian Cyrillic Letters BE, GHE, DE, PE, TE, Janko Stamenovic (collection of selected commented answers received in Unicode mailing list (unicode@unicode.org) between 29.12.1999 and 17.01.2000).